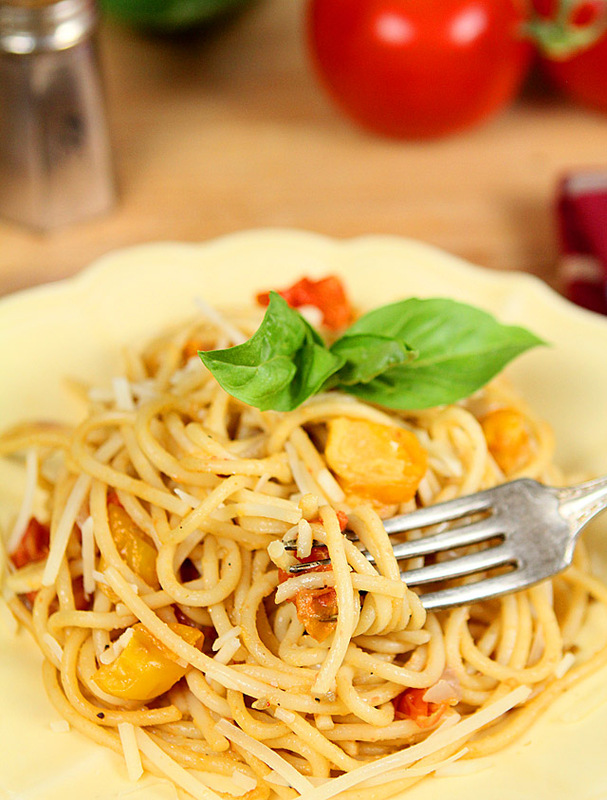 One Pot Tomato and Basil Pasta – a Favorite Summer Dish! Have you ever thought to have a post that just says it all in a couple of words? ‘ This is amazing and easy. Just do it.’ and nothing more? Well, this one pot dish with pasta, tomatoes, basil and a few other veggies and herbs came very close. The recipe is beyond easy…so easy that I was momentarily torn about putting it in this space but just momentarily. We have long spread far and wide but I was reminded of them when I saw this; I would have most certainly shared this simple one pot meal from THE Martha with my Marthas, especially in this season when tomatoes and basil are at their peak and can add so much to a simple meal. The funny truth is that I’m not a big Martha Stewart fan so my knee jerk reaction when someone sent me this recipe was to ignore it…but I was intrigued enough to get beyond that and give it a shot…albeit with a modification or two. Not to defy the queen but it is what I do..I .always have to find a way to make it mine! Most significant revision? I used chicken stock instead of water to cook the ingredients. I don’t know what it would taste like with water but it was so doggone good this way I doubt I’ll be giving that a chance. As a result, I also added very little salt and pepper to my mix since my stock was not low sodium; playing around with the seasoning might depend on what you use too. I think this is a great start to many a quick summer meal; mix up the veggies or spices or change the type of stock and discover another new dish as the result. I am imagining lots of combinations but one thing will remain steadfast for me and that will be the inclusion of fresh summer basil and tomatoes. I know it sounds just a bit strange coming from me but I have to give it to Martha; this really was a good thing. One Pot Pasta – a Favorite Summer Dish! Garnish with additional olive oil, fresh basil and freshly grated Parmesan cheese before serving. 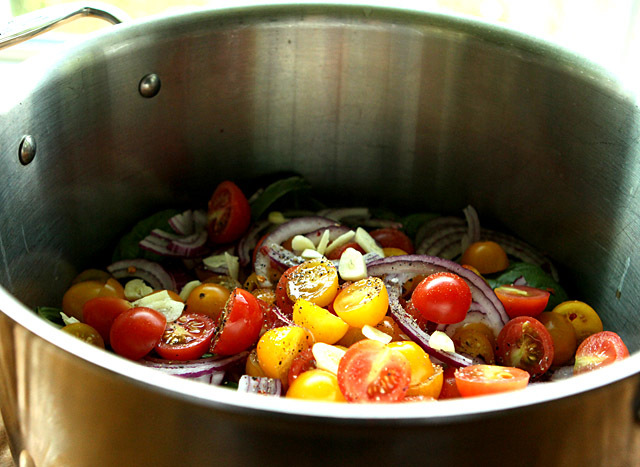 Combine pasta, tomatoes, onion, garlic, red-pepper flakes, basil, oil, salt, pepper, and stock in a large pot or skillet. Reduce heat to medium/medium high so that mixture continues to maintain a slow boil. Stir and turn mixture frequently with tongs until pasta is al dente and the stock has almost evaporated; 9-12 minutes depending on the size of your pasta. Season to taste with salt and pepper, drizzle with olive oil and garnish with basil and Parmesan cheese. I saw this, too and wanted to try it. So glad you did, so that now I know. Hubby is on this no white thing so I must wait for my daughter to visit. I hope she comes soon! This looks lovely! So simple and it sounds fantastically flavorful. I’m going to give this a try this week. Yum! We just loved it Kate; the simplicity could not be beat and it tasted great; we just served it with a piece of grilled chicken and that was dinner. What an incredible weeknight meal!!! Love everything about this pasta! I have to think that Martha would love that you used chicken stock instead of water. In fact, she’d probably agree that it was a great modification to the original recipe. Love that your friends reference you as “Martha”! And now, I’m hungrier more than ever, thanks to this yummy one pot pasta! I’m obsessed with these one pot pasta dinner recipes, they can’t be beat! Thanks for sharing! I am too…I’ve done similar dishes with Israeli couscous but this is my first time with spaghetti…so many variations now to try! Time saving delicious recipe. Addition of egg will be more tasty and nutritious I think. When making pasta for my family and friends (coz I love pasta so much) I always add a few eggs on my recipe. Makes sense…sort of a veggie carbonara! Just what a mom like me needs when schools reopen! This is just perfect! Cooking for me is all about my creative nature…so though I will on rare occasion do something as written, the fun part is fiddling with a recipe and making it my own. Otherwise it’s just boring; even if the food is not. I know you get it! Funny but most of the summer I would not have considered it for the heat but that cool spell we had was perfect and this was a perfect meal…with the chicken broth! Yes, let’s…I’m always swamped so anytime; we could try and get Karen to join us too,. Oh, what a fantastic idea! At first I thought this was going to be Martha’s Spaghetti No-Knife which I made for years…until I found out that the hubby wasn’t a fan. This incorporates the same ingredients, plus more…I must try this. Thanks, Barb…perfect summer meal! This looks so lite and refreshing with all the veggies in it. This would make a great summer meal. I imagine some revisions would make it good all year but for me? 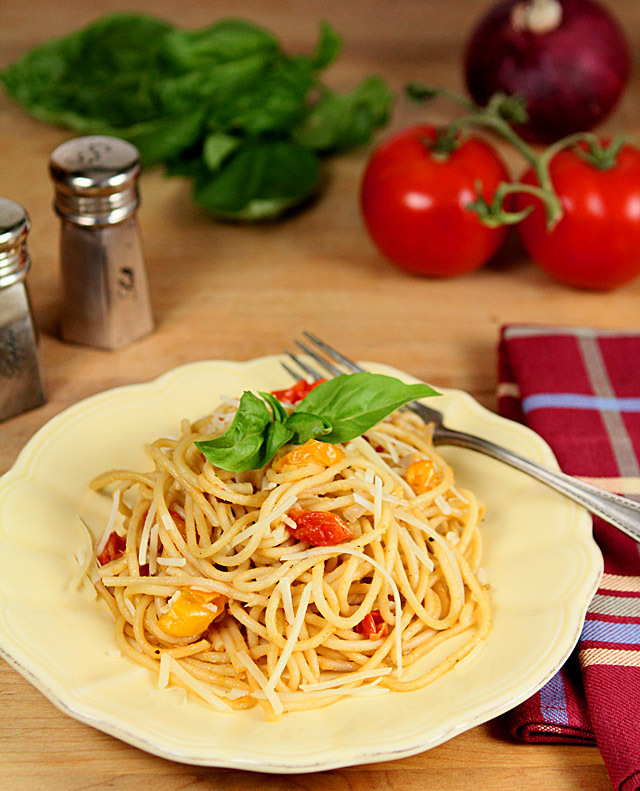 Only fresh tomatoes and basil make this version exactly that…a great SUMMER meal! It’s odd, I never look at anything Martha Stewart does, but whenever I come across one of her recipes and make it, it’s usually at least good. This recipe really has a lot going for it – really easy and looks so tasty. I’d never have thought to add the pasta before the stock came to a boil, though – really interesting technique. This looks like fun – thanks so much. I don’t either John but my kid thought this looked good and sent it to me and she was right on…besides Martha isn’t really doing that work anymore right? Absolutely delicious! All those wonderful summer flavors in there! I don’t even have to cook this to know precisely how it tastes. All I’d need with this is some good bread and a glass of wine. One pot?? Count me in!! This looks awesome and we love pasta of any kind around here. Especially the quick, easy and delicious kind! Love the one-pot plan to make this meal. Even better is that my small container garden on the deck is made for this meal– basil is thriving and the cherry tomatoes have just started to turn red this week. Hmmmm I am not a M. S. fan as well, but you’re right, this is a very intriguing recipe!!! It is definitely worth a try! I’d keep this pasta in one pot! Everything tastes better when cooked in chicken broth. I will definitely be making this super simple meal. I love Martha’s recipes, especially since she loved one of mine. She’s got a talented group of people developing some really great recipes for her.